I had no idea that David Galas, an artist who I respect and admire greatly, was a founding member of Lycia, so when I found out I revisited my Lycia albums again. I first came across Lycia when researching what music I might be interested in via a feature on Amazon. This album came up in a recommended list compiled by another Amazon customer and I thought I’d give it a go solely based on their description of the sound. Lycia has a very unusual style. Long sustained haunting chords with almost inaudible vocals and some excellent bass, which, on reflection, is quite clearly recognisable as David Galas. Think Fields of Nephilim only darker. This is the kind of music you would probably want to listen to driving across the desert or moors at night. Perhaps when you have a headache and are feeling pretty down on things. Ambient experimental Darkwave. Haunting you. Doing things to your mind. 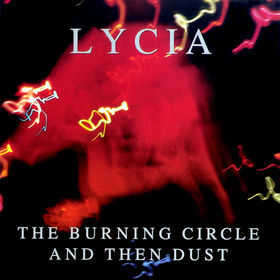 Totally recommended, highly appreciated, Burning Circle and Then Dust is possibly one of the most unrecognised acoustic masterpieces of the noughties.